In the UK, there is so much that goes into choosing a good place to enjoy a drink or have a bite to eat. Would we, for example, be tempted by an establishment that looked like someone’s house, with a thick beaded curtain obscuring the door and little signs of life. If we were brave enough to venture indoors, would we remain if we saw a dimly lit interior, against one wall of which was stacked crates of empty mixer bottles, a TV blaring out and few stools available for comfort? Probably not, but in Spain this is often the norm for the local bar and don’t ever let that put you off! On a previous visit to Granada, Andrew and I ended up to the village of Niguelas on the hunt for somewhere to eat. 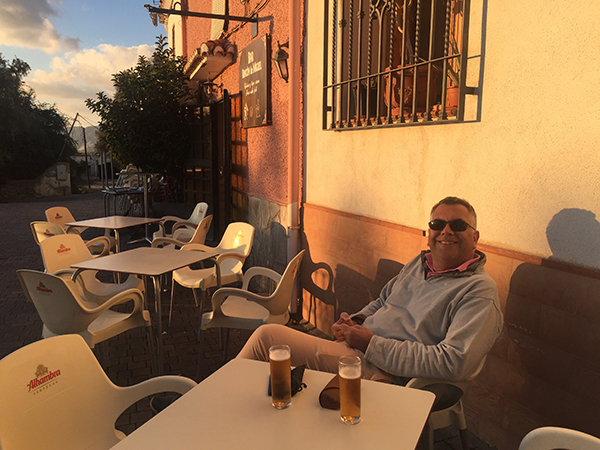 In the heart of the village, everywhere seemed to be closed, so we resorted to a bar on the outskirts of this little village, nestled as it is in the shadow of the Sierra Nevada. We knew it was a bar simply because there were some tables and chairs outside, softly lit by the setting sun; otherwise, there was little to give away the identity of this particular hostelry. We had a drink outside before the sun set, but as this was April the temperature plummeted as soon as the sun set. We looked at each other to decide whether or not we should risk venturing indoors. We did, and we had a wonderful night. In the Bar el Rincon de Miguel there are probably no more than 8 bar stools, a short bar, a TV and not much else. Miguel is alone behind the bar and what he manages to conjure up on a single hotplate is nothing short of miraculous. That grin only got wider as Miguel plied us with beer and tapas. We went again this week, and were equally delighted. Miguel is a big-hearted sort of chap, totally at ease and welcoming. Order any drink and Miguel goes about his business; he has a vat of egg and spinach mix that he ladles onto his gas-lit griddle and off comes two delicious, flavoursome omelettes to accompany our beers. Second round, and we were presented with two rolled pancakes filled with delicately spiced pork, drizzled with a balsamic reduction. Miguel created works of art. Fried quails egg! Two glasses of extremely palatable house white wine followed (as it tends to do!) 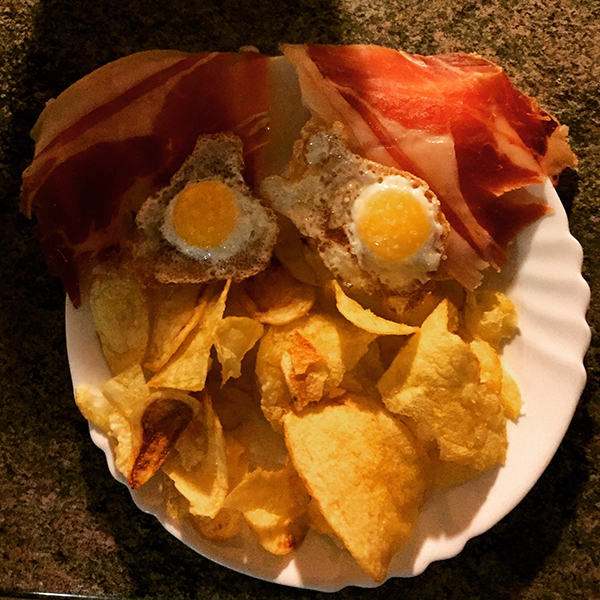 and we had delicious lomo de cerdo and then jamon with quails eggs. All this is prepared by Miguel behind the bar as he goes about serving his customers, all of whom receive the same delicious plates with their drinks. There is no flap, or kitchen histrionics, no other member of staff, let’s be honest! And this is good honest food, that comes free with your drink. This is Miguel’s bar and it has atmosphere in abundance, and a good night out can be had for €15.